Concern over ecological issues such as biodiversity, planted forests, use of pesticides and fertilizers, wetlands conservation, watershed ecology, and aesthetics has led to a remarkable growth in the number and intensity of rules and regulations that affect forest management and impact the procurement of wood-derived raw materials. Similarly, concerns about the sustainability of the forest resource have stimulated growing interest in forest management certification, accounting of carbon stored in forest lands and chain of custody arrangements to deter illegal logging, to name a few. Responding to these concerns complicates forest management, increases costs, and has the potential to limit access to the wood resource, so it is critical to incorporate the best available science when forest-related policies are being considered. Owners or managers of woodlands typically seek to: (i) maintain efficiency, flexibility and low operating costs in forest management activities; (ii) retain the ability to manage and ultimately harvest their woodlands; (iii) encourage a strong market for harvested wood; and (iv) sustain woodlands throughout repeated growth and harvest cycles. Companies that procure wood as a raw material for their manufacturing needs also seek continued access to the wood resource without artificial and unnecessary restrictions that would diminish supplies, lower quality or raise costs. The policy debate on any given issue related to forests as a wood fiber resource must be guided by a body of science that supports enlightened policy choices. For example, achieving science-based solutions to wetlands conservation issues can be substantially enhanced when reliable information is available regarding wetland soil characteristics or the adaptation of tree species to changing water levels. Science can add significant value to the public dialogue concerning conservation of forest-based endangered species by, for example, providing information regarding species demographics and taxonomy, or identification of features of forested habitats that support the recovery of a given imperiled species. Despite decades of scientific research on the ecology and sustainability of forest management practices, the available body of science often exhibits substantial gaps that frustrate the development of well-informed, science-based policies to guide the management of North American forests. 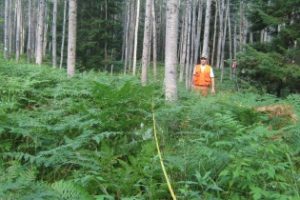 Forest-related studies are especially resource-intensive, given the lengthy time periods required to measure trends associated with a given forest treatment and the large number of variables that can affect the results. Furthermore, the results may differ greatly depending on the species, region, forest ecotype, etc., and thus are difficult to generalize. Despite careful planning and execution, forest-related studies may be confounded by events beyond the control of the investigator, such as an unanticipated drought or wildfire. Because of these challenges, the available body of science may not be adequate to support policy development that is balanced and scientifically grounded. Hence, an important part of NCASI’s mission is to identify situations where the forest science that underpins contemporary policy-making is inadequate and then sponsor scientific research to address those shortcomings. To identify potential opportunities, NCASI maintains a vigorous consultative relationship with the community of North American foresters, including representatives of landowners, forest products companies, regulatory agencies, academic institutions and other stakeholders. NCASI, in consultation with its advisors: (i) monitors developments with the potential to impact forest management policy and practices, which may, for example, arise from emerging regulations, evolving standards for forest certification and sustainability reporting or marketplace demands; (ii) identifies gaps in the state of scientific knowledge that underpins current or anticipated future forest-related policies or practices; (iii) articulates scientific investigations that will address and rectify information gaps; and then (iv) undertakes such research, either internally or by sponsoring work by a university, independent research facility, or well-qualified consultant. Given the importance of good science to decision-making that might affect the industry’s ability to obtain fiber-based raw materials at reasonable cost and maintain continued access to the wood resource, it is appropriate that forestry-related activities are a prominent part of NCASI’s overall program. Indeed, forestry-related activities account for one-third of NCASI’s annual budget, not counting projects with external sponsorship. In addition to research funded in whole or in part by NCASI membership dues, NCASI typically coordinates funding for, and oversees the execution of, cooperative research totaling several million dollars annually which is sponsored by private foundations, trade associations, industry consortia and private donors. Regardless of the funding source, NCASI supports a significant amount of independent, forest-related research by universities and private research institutes. NCASI encourages the publication of its scientific research in the peer-reviewed literature, and dozens of articles are published each year. Forest-related research may also be reported in NCASI Technical Bulletins that are placed in the public domain. Technical Bulletins may be employed to enhance transparency of the work, by reporting additional detail regarding an investigation, once the study has been published in an appropriate journal. Technical Bulletins may also be used to report the results of certain types of investigations — e.g., data compendiums — that are not suitable for publication in scientific journals. Thus, NCASI’s forest-related research investigations are transparent, stakeholder-driven, and internationally recognized for their high quality and unique insight into an important sector of the economy.